It's been a long time since the last posting! Time flies. So, here are some screenshots of other stuff we have been working on lately. Both areas are in progress and will look better than this in the final game! A swampy area with light buildings and walkways. The vegetation you see here is temporary! But I am happy we are finally starting to work on this area; if you look at it in the trailer, for example, it's obviously very much more temporary. The island is getting more and more beautiful with every post. To me you could just release it as it is, and it would be aesthetically pleasant. Vegetation on second picture doen’t look very swampy, but definitely isn’t out of place. I have seen some swamps in real life, and they are not as “swampy” as people think the are. The vegetation differ only a bit from the surrounding forest’s one. Boy howdy, does that look good! This may have been answered before, so I apologize if I am redundant, but will this game include a day/night cycle? And will any sort of weather occur? It’s not a simulation-kind of game so there is no weather or day/night. But when you play the game, it will make sense why this is so. You can take me out to lunch if and only if you are able to solve the fiendishly devilish puzzle that is hidden in plain sight on the text of this very webpage. To do so will require you to bear “witness” to the birth of your own existence, to allow your eyes to stabilize reality out of the never-ending flux of the unobserved. Then we eat! Ugh! What have I done… But I’m seriously wondering if the whole game takes place in one day, in the fiction? I know that Braid takes place in one night, the whole game. I really love that and no one has commented on that. As a matter of fact gameshave never paid attention to this, and its very interesting. I hope the Witness feels like Braid in that sense too, like it’s grounded on reality and based in the real world. Like Muholland DR. 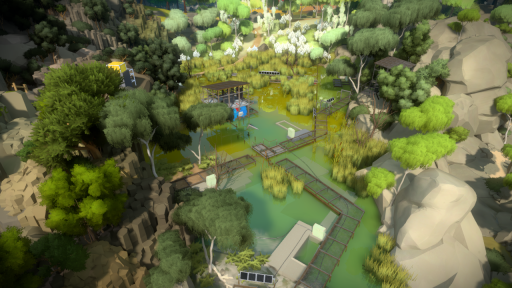 Even tough The Witness is very surreal and dream-like, it could be based or grounded in the real world just like Braid was. Anyways, raise ur hands if ur getting this for PSQuad!! It IS grounded in reality, the one in which special relativity tells us that all time already exists, and in which your mind is simply a quantum wave collapsor, choosing which already-existing time-slice will become your future that already was. In other words, you may or may not have already played The Witness, but I can tell you unequivocally that there is no time-slice in which you and John are eating lunch together! eternal and golden, those arches are, as you wait in line to order a 20-piece chicken mcnugget as john who IS john waits patiently at the table behind you. finally the turn is yours and you call back to ask what kind of sauce would Is John want to put on his nuggets. he replies in typical voice-over fashion, but now you see the cash register is really a panel, of onion rings & french fries, separate them you cannot because they are both delicious, and this impedes your progress, while Is John shatters into a million pieces of Was John, Will Be John, Might Be John, Was Always John, and So On John. Wow, they look incredible already. Great work, Jon. On a side note, will this game possibly get a Mac release on Steam? this looks awesome, i really cant wait for this game to release. this looks like it could be the greatest botanical garden to visit. This game is so goddamn beautiful. Just look at the beautiful trees and reflection and that little stream. Can not wait to play it. Most anticipated game of the year. Kudos to your art team. Sorry for posting twice, but I was wondering, what were your inspirations when it came to the art style of the game? The lake is startlingly realistic in its formations and patterns. It makes me feel like I’m looking at a real place. I love the details like how the rock formations all look unique and how you can see the ground in the shallow areas. I’ve loved watching this game come along. The places feel so natural and possible. I’m really looking forward to digging in to the gameplay. Woah, you can see the mountain from the center of the island. I’m expecting no map then (at least not integrated in the HUD), as the geography seems enough to move around without losing yourself. thank you wery much for sharing these with us. I beleave that whole comunity cant wait till you release your game. I saw you first at Feb Sony conference and your intro to The Witness had big impact for me. I beleave that words like “we worked very very hard to make world as compact as possibe”, “there is no filler” and “everything is were it is for a reason” must get everyone attention.. Anyway, thank you and your studio for not surrendering during this 5 yrs long development period, as I am developer I understand how hard it must be to work on something for 5 yrs without any major release to public, I wish you get the best of your ideas !! John, you’re an inspiration for every indie developers. I hope you keep making these unique games for as long as I live. I’ve watched quite a few interviews you gave, and I like your input on things. You’re level-headed, and you explain everything so clearly and eloquently. I enjoyed Braid quite a lot, and felt it was a refreshing game. Now I can’t wait to play The Witness. It looks absolutely gorgeous already, and I love puzzle/Adventure games. There’s a kind of Myst vibe in this one, which I really like! Keep up the awesome work John! This is awesome! One little tip on the vegetation of the swamp area. I know its only temporary but I have no clue where its going. This one may sound weird but the green values are not in harmony, making the whole thing looking a bit too heavy and tiring to the eye. I’m happy to see you back on here. I’m very eagerly anticipating The Witness and hope these last few months are enjoyable for you. Which phase of game development is typically the most gratifying for you? 1. Early conception, 2. bringing the basic game to life, 3. finishing touches, 4. release and feedback? For my projects (not games, necessarily) I seem to like 1,2 and 4, but generally dislike 3. Those orange trees look absolutely briiliant. 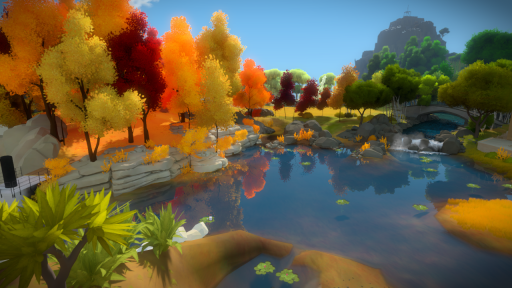 will you have original music for The Witness? I really love Braid’s soundtrack. I was surprised to learn that all the music was licensed. It really fits perfectly and you have great taste. There is (almost?) no music in The Witness. The sound design in this game is about weaving together a lot of rich environmental sounds. Speaking of sounds, will there be any puzzles that are based around listening to things? I really liked the spaceship age in Myst, where the puzzles revolved around keeping a keen ear rather than a keen eye. They were really satisfying to solve. Yes, there will be some audio puzzle. This is why you can leave two areas uncompleted and still pass the game. One area is the color puzzle and the other is the sound based puzzles. They are optional (but not really) obviously for people who are color blind and/or deaf. i’ve spotted some contradictory elements in these screenshots – i guess it’s done deliberately! :) good work! Its f***ing beautiful… Can’t wait to play! New screens look beautiful! I’m wondering, is this the same lake that used to host the windmill? Hoping it’s still in there somewhere, it was so iconic in the early screenshots. Umm, The screenshots are beautiful ,but the water in the first one is rather blocky(where it meets land) Is that intentional or are you going to smooth it out?